Christmas traditions vary from country to country. Christmas celebrations for many nations include the installing and lighting of Christmas trees, the hanging of Advent wreaths, Christmas stockings, candy canes, and the creation of Nativity scenes depicting the birth of Jesus Christ. Christmas carols may be sung and stories told about such figures as the Baby Jesus, St Nicholas, Santa Claus, Father Christmas, Christkind or Grandfather Frost. The sending and exchange of Christmas card greetings, observance of fasting and special religious observances such as a midnight Mass or Vespers on Christmas Eve, the burning of a Yule log, and the giving and receiving of presents. Along with Easter, Christmas is one of the most important periods on the Christian calendar, and is often closely connected to other holidays at this time of year, such as Advent, the Feast of the Immaculate Conception, St Nicholas Day, St. Stephen's Day, New Year's, and the Feast of the Epiphany. Every Christmas we sing for celebration. And a lot of songs about Christmas will be published. You can enjoy them online with streaming service. But what if we want to download them and save them to our phones? In this article, we'll show you different ways to get Christmas music for free. Due to copyright protection, you are not allowed to save music from iTunes. If you need to transfer and keep some Christmas songs from iTunes to iPhone easily, you'd better get an useful tool iTunes DRM Audio Converter. It helps you to convert Apple Music or iTunes M4P to plain formats like MP3/WAV/AAC/FLAC, then you can keep them on your iPhone forever without worrying the subscription cancellation, or upload them to other music apps. Step 1 : Get NoteBurner iTunes DRM Audio Converter according to your operating system. Then launch the software after installation. Click the button "+" to add music, it will show you a pop-up window. All of songs you have downloaded from iTunes will be displayed here. You can choose any of the songs you want to convert. Step 2 : Select songs you need, then click on "setting" button on the top right corner to set the output format as you need. You can choose output path, output format, and even the conversion speed. WAV, AAC, MP3, and FLAC are available to choose. Step 4 : After that, you just need to tap the Convert button. Wait for converting. After a successful conversion, the output folder will be open automatically. Or you can click the History button on the top-right interface to find the converted music. The converted music is DRM-free, you can transfer them to any of your devices. Step 1 : Download and install Syncios iOS & Android Manager to your computer, and run it after installation. Then connect your phone to computer. Check your phone screen and keep it unlocked when connecting. Step 2 : On the menu top bar, you can find Video Downloader, click on it. You are allowed to download online videos as long as you get the URL. Various online videos are supported to download. For instance, if you want to download YouTube videos, navigate to YouTube (or other video websites) to locate the videos you would like to download. Simply right click on the video playing window and select "Copy Video URL" to copy the URL. Step 3 : Then back to Syncios Manager. Click on Add URL(s) button and paste online video URL to the pop-up box. 100+ video sites could be added using "Enter" to place each URL on the box on each line. Step 4 : Choose the download quality you need then click on Start Download to start downloading. It takes a while to analyze videos. After downloading, you are allowed to convert and save them to your iPhone. The downloaded videos would be displayed on Video App. If the downloading process is interrupted, check your Internet and try again. For Ultimate users: If you are a Ultimate user(version compare>>), you are allowed to convert the downloaded videos automatically and directly save them to your iPhone XS, otherwise, you need to convert the videos manually by using the "Video Converter" tool on the Toolkit. If you need to move Christmas music from iTunes Library to your iPhone, you may want to move all songs from iTunes Library to the new phone. 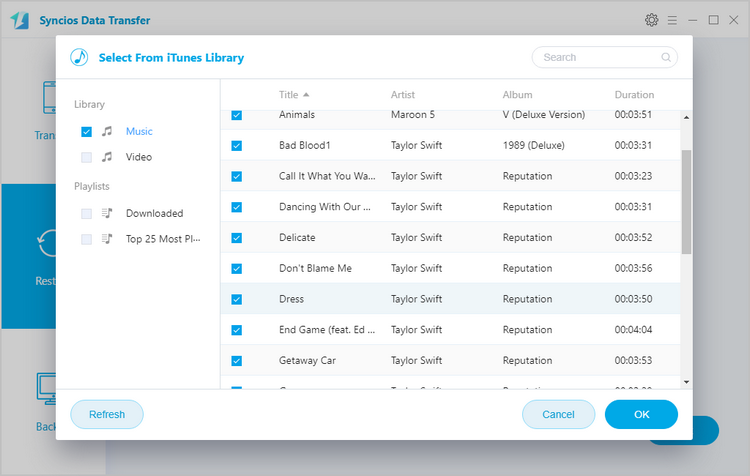 This tutorial will teach you how to get music from iTunes Library quickly. With the help of a handy data transfer tool, we can effortlessly sync all music from iTunes Library to iPhone. 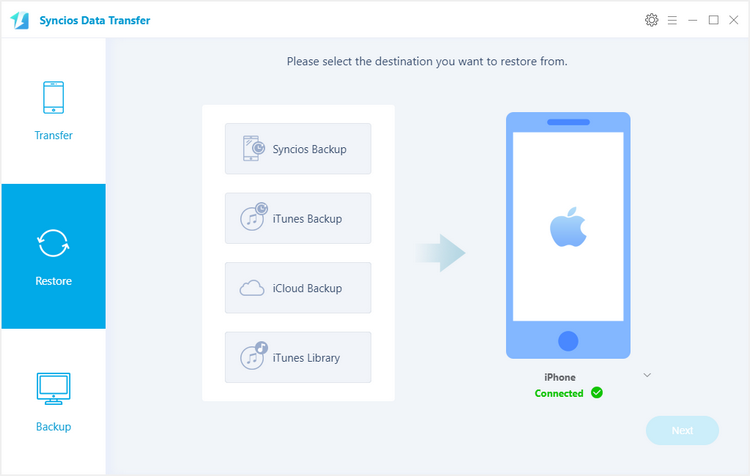 Syncios Data Transfer is a comprehensive iOS & Android data transferring tool, which allows you to move all you data like messages, contacts, call logs, music, video, etc between iOS & Android devices with great convenience and safety. And it provides a quick way to retrieve data from iTunes, iCloud backup and backup and restore phone data. Now let's check out the details below. Step 1 : Download and install Syncios Data Transfer to your computer from below, then launch the program. Then connect your iPhone to your computer via USB cables. When your iPhone is connected and recognized by the program, your iPhone will show in the window. Remember to unlock your phone when connecting in case any pop-up message comes out. Step 2 : To get Christmas music from iTunes Library, Navigate to Restore > iTunes Library on the main interface. Syncios Data Transfer will list out your iTunes library on the middle of the panel. Simply select your desired ones to transfer to your device. Many people think Christmas is on December the 25th and that's all there is to Christmas. However, for many people around the world, in different countries and in different Christian traditions, Christmas lasts for a lot longer than that - and it's even celebrated at different times! When do you celebrate Christmas? With three different ways we provide above, you are able to save Christmas songs to your phone and enjoy your Christmas with Christmas songs anywhere and anytime. Download iTunes DRM Audio Converter to obtain Christmas songs from streaming service, get Syncios iOS & Android Manager to enjoy online Christmas music, or have a free try with Syncios Data Transfer to retrieve Christmas music from iTunes Library. Now, Merry Christmas, enjoy it!